Welcome to the 8th Annual Saskatoon Corporate Challenge. 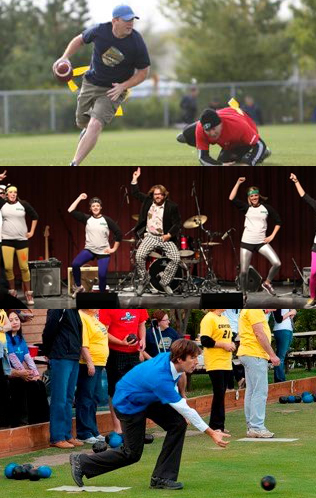 The Saskatoon Corporate Challenge is a one week event from September 9th-13th, 2019 focused on promoting a healthy, team oriented business community through friendly competition while helping raise awareness and make contributions to local charities. The Corporate Challenge consists of team based physical and mental challenges that are geared toward promoting team building and employee engagement. Teams will compete against one another in a series of five events over the course of a week with the winning team being named the Corporate Challenge Champion. The Saskatoon Corporate Challenge has raised over $150,000 in seven years for Saskatoon Charities on behalf of the Saskatoon business community. Registration deadline is June 28th, 2019. There are limited spots available for the 2019 Corporate Challenge so be sure to register your team early. Also check out our sponsorship area to find out about how to support Saskatoon's largest business team building event. Are you ready? Make sure to check out our full list of events and see if you and your company are up to the challenge. There are a limited number of spots available so be sure to get your co-workers on board and get a team signed up to reserve your spot. We will be donating over $20,000 to the SPCA.